Christians adopted the symbol of the peacock to represent immortality. This came from an ancient legend that the flesh of the peacock did not decay. It is also associated with the resurrection of Christ because it sheds it old feathers every year and grows, newer, brighter ones each year. If the peacock is portrayed drinking from a vase it symbolizes a christian drinking the waters of eternal life. In addition the " multitude of eyes" upon its stunningly beautiful fan tail, suggested the all seeing eye of God. 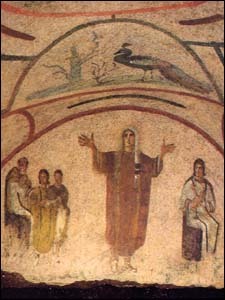 Peacock above orante (figure of a young woman with hands lifted in prayer), Cubicle of the Velata, Catacombs of Priscilla, Rome (second half of the third century). 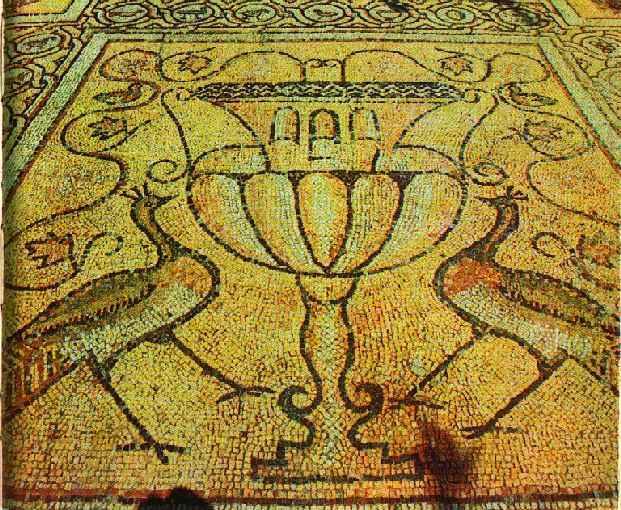 Peacock in mosaic panel, Khersonesus, Sevastopol. Another view. Florence. Sarcophogas with chi-rho flanked by two peacocks. Fresco of Peacock decorating tomb, catacombs. Peacock as part of decoration of a columbarium, Catacombs of St. Sebastian, third century. Peacock above orante, Cubicle of the Velata, Catacombs of Priscilla, Rome.